(CNSNews.com) - President Donald Trump is demanding that 3,000 Central Americans immediately halt their "caravan" journey to the U.S., or else he'll close the southern border, period. 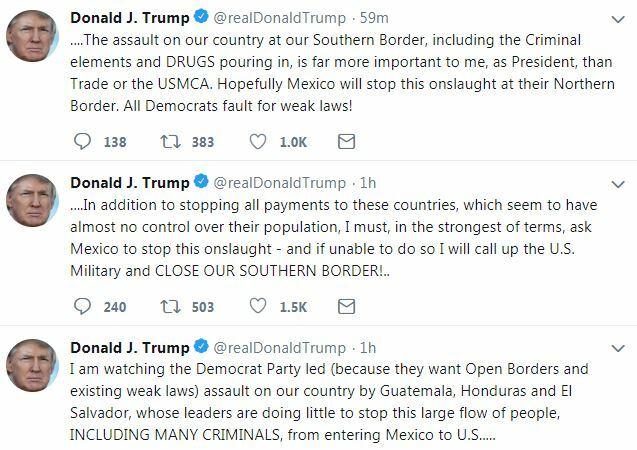 -- In addition to stopping all payments to these countries, which seem to have almost no control over their population, I must, in the strongest of terms, ask Mexico to stop this onslaught - and if unable to do so I will call up the U.S. Military and CLOSE OUR SOUTHERN BORDER!.. -- The assault on our country at our Southern Border, including the Criminal elements and DRUGS pouring in, is far more important to me, as President, than Trade or the USMCA. Hopefully Mexico will stop this onslaught at their Northern Border. All Democrats fault for weak laws! -- Hard to believe that with thousands of people from South of the Border, walking unimpeded toward our country in the form of large Caravans, that the Democrats won’t approve legislation that will allow laws for the protection of our country. Great Midterm issue for Republicans! -- Republicans must make the horrendous, weak and outdated immigration laws, and the Border, a part of the Midterms! As CNSNews.com has reported, Secretary of State Mike Pompeo is scheduled to visit Mexico on Friday, and a senior State Department official told reporters in a background briefing the migration issue would be “prominent” in Pompeo's discussions with Mexican officials.